Today's Post is over on a brand new, amazing collaborative blog! 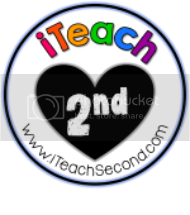 A whole bunch of teacher bloggers and I have joined forces to bring you the blog iTeach Second! I am working with some amazing teacher bloggers such as Fern Smith, Nicole Sanchez, Angie Olson, Carla Federer, Peggy Means, Andrea Crawford, and Ashley Schroeder, just to name a FEW! These ladies rock! Each day has a different theme: for example Friday is Freebie Friday. Hello! Head over and see! Thursday is Tipster Thursday so I have a super fun tip for you on how to handle all that incomplete work that gets lost in your students' desk! Check it out and let me know what you think!